Revenge of the Afronauts is an album written, recorded, produced and mixed by youth hailing from throughout the Bull City: from Durham School of the Arts, to Northern, to Early College; the album features 10-tracks that reflect the heart and soul of Durham’s next generation of Hip Hop purists. Blackspace Hip Hop Director Joshua Rowsey (aka J Rowdy) has been teaching weekly writing, performance and production WokeShops with Durham youth since 2016. Rowdy also host’s Blackspace’s flagship weekly street performance in downtown Durham called Med City Cypher – where youth share improvised lyrics and original beats every Friday starting at 9:19PM. Blackspace has been a unique hub for Hip Hop education. Legendary Hip Hop producer Pete Rock visited the Durham studio to talk music, industry and creativity during Black Wall Street in 2016. Multi-platinum-selling artist and producer Mike Posner came to Blackspace in 2017 to teach beat making and meditation. He transferred gigabytes drum sounds, digital instruments and drum kits onto Blackspace hard-drives, and many of his sounds have ended up on Revenge. Local producers: Trandle, ZenSoFly, Ebz, Alan Thompson and Shana Tucker regularly frequent the space. In 2018, after two years of study, mentorship, practice and growth Blackspace’s Afronauts were finally ready to lift off! Executive Produced by J Rowdy and mixed by Blackspace youth under the guidance of producer and sound engineer Rem (the co-owner of the local Cotton Candy company called WonderPuff) REVENGE is an album of original, refreshing North Carolina Hip Hop. Click here to stream the album on Soundcloud. Every Friday at 9:19PM youth gather in downtown Durham in front of the bronze “Major” bull statue to rap, sing, make beats, and create community together. We call it the MED CITY CYPHER because it takes place in Durham, the City of Medicine, and becuase the weekly ritual is deeply medicinal. At the cypher, youth are challenged to improvise and think on their toes and to build self-confidence and empathy. It’s group therapy through Hip Hop! The Cypher provides safe space for kids to occupy the heart of our city every week, to speak their truth unapologetically, affirm self-esteem, and help the creative fires inside each of them radiate. In doing so, they transform, not only themselves but the City of Medicine as well. Youth interested in Hip Hop can join our freestyle and theatre performance wokeshop, facilitated by emcee/founder of the UNC Cypher, J Rowdy. Write rhymes, record vocals, and get ready for live performance and recording. Check out Jamm, Zone and Naima in this Blackspace-produced banger titled “919”. Learn more here. Blackspace hosts weekly writing and performance workshops for Black and Brown youth aged 13-19 to work on developing their writing skills and performance techniques to take their work from the page to the stage! Everyone is not expected to slam (compete with their poetry) but everyone is encouraged and given the tools to convey their works to an audience. Poetry workshops are facilitated by Program Director/Slam Master Mariah M.
On the 3rd Tuesday of each month, workshops culminate in poetry slam competitions and open mics, which are free and open to the public. The mic is open to youth of all creeds and cultures between the ages of 13 and 19. Blackspace Poetry Youth Slams are competing for the chance to be a part of the Blackspace Poetry Slam Team that will apply to Brave New Voices (BNV). Five youth will make the team. Signups for the open mics/slams can be found at this link! 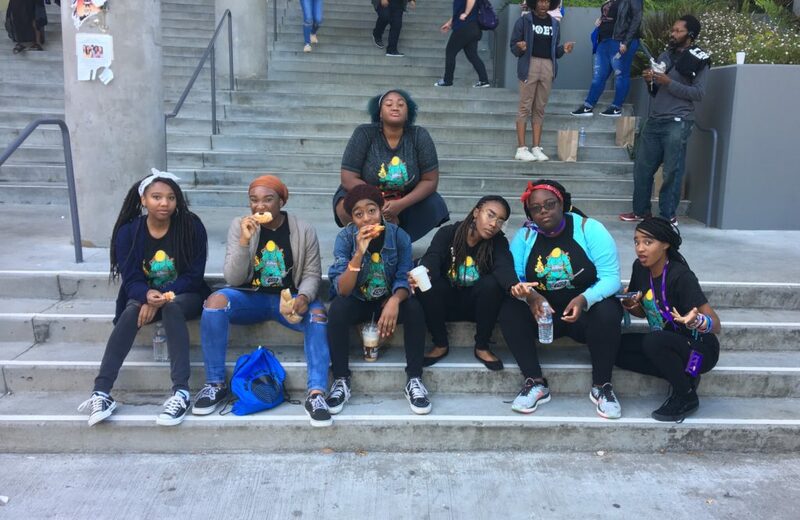 Brave New Voices is an annual international youth poetry slam and festival, which brings together the most outstanding and outspoken youth poets from around the world for five days of workshops, slams, showcases, community service and civic participation events. Blackspace Poetry first participated in BNV in 2017: as the first team out of Durham to compete at Brave New Voices. For more information on all things Blackspace Poetry, email Mariah M.